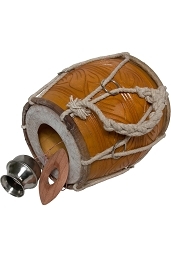 The Khamak is a stringed percussion instrument originating in India.The Khamak consists of three basic parts. A bowl which is often made out of wood is connected by several strings to another, smaller piece (also usually made out of wood). The bowl is held under the arm holding the smaller piece in the hand of same arm. Finally, the strings are plucked by the other hand while adjusting the tension of strings creating the desired sound.